STING ligands enhance the induction of effector CD8+ T cells. (A) Left: Representative flow cytometry data showing EV10-specific CD8+ T cells expanded in the presence of Flt3 ligand and various adjuvants. Cytokines: TNF, IL-1β, IL-7, and PGE2. Plots are gated on viable CD3+ events. Percentage values represent HLA-A2-EV10 tetramer+ cells among total CD8+ T cells. Right: Data summary. Each dot represents 1 HLA-A2+ donor per condition. The dotted line shows the mean percentage of HLA-A2–EV10 tetramer+ cells among total CD8+ T cells incubated with cytokines in the absence of peptide (n = 20). 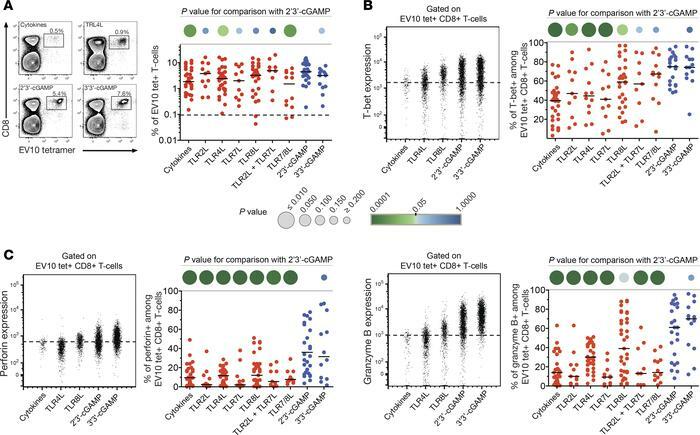 (B) Intracellular expression of T-bet among EV10-specific CD8+ T cells primed as in A. Left: Representative flow cytometry plots gated on viable HLA-A2–EV10 tetramer+ CD8+ T cells. The dotted line shows the limit for positive expression. Right: data summary. Each dot represents 1 HLA-A2+ donor per condition. (C) Intracellular expression of perforin and granzyme B among EV10-specific CD8+ T cells primed as in A. Details as in B. Horizontal bars indicate median values. P values are represented as circles with variable size and color intensity (Mann-Whitney U test).